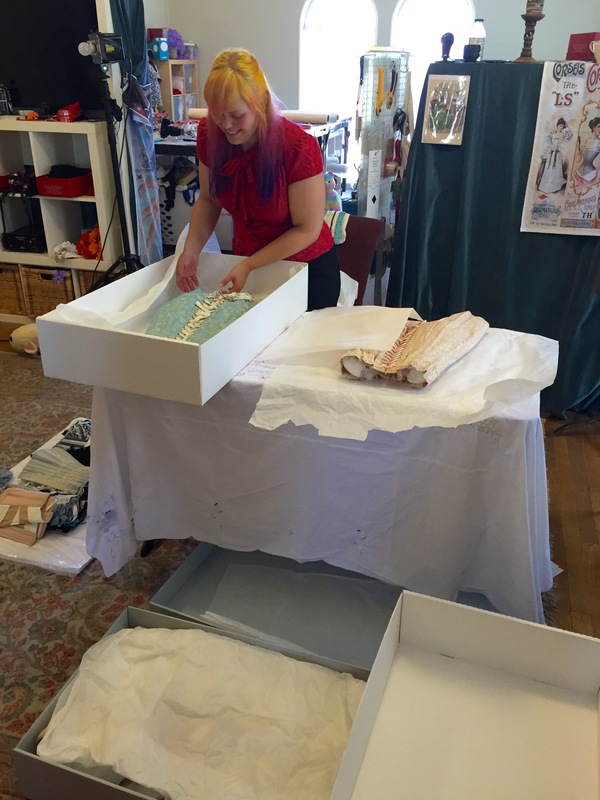 We had the lovely Joni Steinmann of Rainbow Curve Corsetry into view the collection recently. 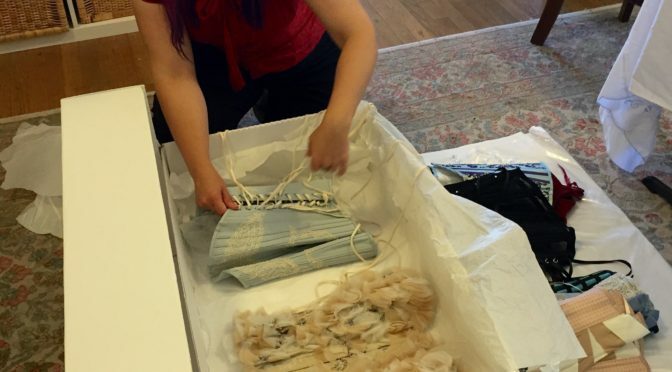 After meeting her at the 2015 Oxford Conference of Corsetry we talked about how to start prepping for better conservation of my collection pieces. I have a very small collection of antique and contemporary corsetry but it wasn’t going to last for the long haul without proper storage. My assistant the lovely Breanna and I started stuffing corsets with acid free tissue paper earlier this year but had only gotten through half my collection. My friend Laura helped source more boxes and I made those up while Joni visited and they are all filled with more corsets waiting for boxes. It is lovely to have visitors for my pieces as they are often abandoned as I focus more on producing corsetry then collecting it these days. The collection has slowly started to include more undergarments as well as historical pieces beyond corsetry that we have available to study. Breanna for instance borrowed a Victorian bodices for private study in an independent study class for her university last semester. We also have lovely clients who have donated a few pieces including some antique Edwardian drawers and Edwardian petticoats. So many things to add to the site coming up.